In this eagerly anticipated spin off from Donna Ball's beloved Ladybug Farm series, Paul Slater and Derrick Anderson set about opening the Hummingbird House B&B with their usual style and flair, only to find that they may have taken on more than they bargained for. Despite constant coaching from their friends Cici, Bridget and Lindsay, they don't seem to be able to do anything right. Before they know how it happened, they are at odds with their teenage housekeeper, overwhelmed by a zany spiritualist who seems determined to take over their lives, and, most horrifying of all, on the wrong side of the law. 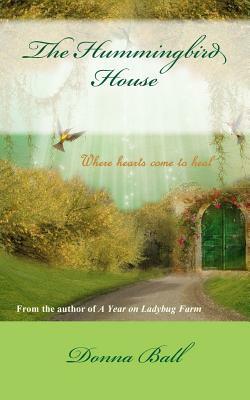 But while they wrestle with one misfortune after another, forces are at work behind the scenes that have put unrelated strangers on the road to The Hummingbird House, where accidents become destiny, defeat is transformed into victory, and all that is required for a miracle is an open heart. Welcome to The Hummingbird House, where you may not find what you expect, but you'll always find what you need. "Hilarious and heartwarming" --North Carolina Pilot. Donna Ball is the author of over a hundred novels under several different pseudonyms in a variety of genres that include romance, mystery, suspense, paranormal, western adventure, historical and women's fiction. Recent popular series include the Ladybug Farm series by Berkley Books and the Raine Stockton Dog Mystery series. Donna is an avid dog lover and her dogs have won numerous titles for agility, obedience and canine musical freestyle. She divides her time between the Blue Ridge mountains and the beach, where she lives with a variety of four-footed companions.